I love to cook, often without a recipe, and during those times I find myself wanting to assemble a quick melange of complimentary spices to apply to my dish. How can I arrange my spice cabinet so spices that play well together are near each other? Assuming that complimentary spices tend to be used together, and that dishes with complimentary spices are well reviewed, recipe review data should be able to help me sort my cabinet. First, the data. I found a free API for recipes that could be queried by ingredient (unfortunately the API has since been discontinued). I wrote a quick library for the API endpoints in Python. Then I wrote a script to walk through a list of 19 common spices and collect recipes as fast as the rate limit allowed. After a week, I walked away with 63k recipes. My data contains an average rating and a number of reviews per recipe. The number of reviews follows an exponential distribution, with most recipes having few, if any reviews, but a handful snowball to hundreds of reviews. I would like to use the number of reviews to weight the recipes and their ratings. However, I don’t consider a recipe with 200 reviews to be 200 times as important. To compensate, I am log-scaling the review counts. Now that my scores are adjusted, I need to re-shape my data. I collected my recipes one ingredient at a time and the API only returns the recipe IDs, not full lists of ingredients. To reach a workable data set I need to create columns for each spice and group by recipe IDs. 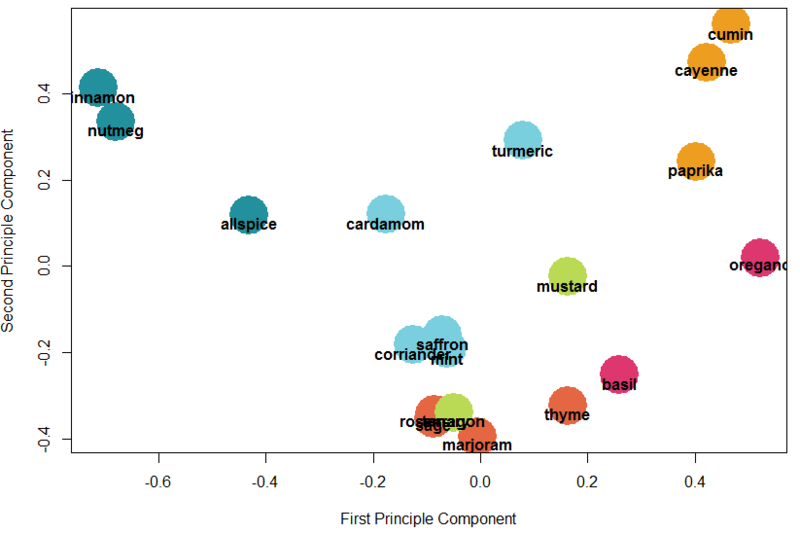 Finally, I can find the correlation between my spices, based on weighted recipe ratings, and generate a hierarchical clustering. I like to give k-means a shot at the problem to validate my results. 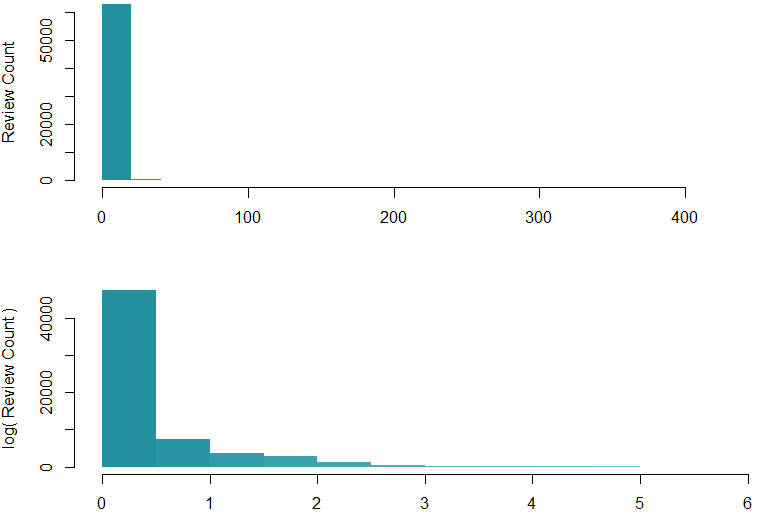 I will visualize k-means with PCA. Given a K of 6, k-means develops exactly the same grouping! 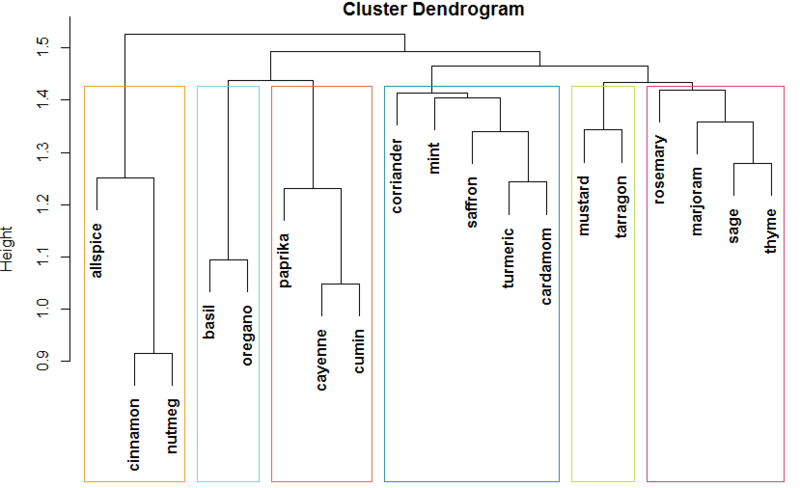 PCA does reveal some similarity between the herb, French, and specialty clusters.